SWOT Analisis method is often used to identify and categorize significant internal factors (strengths and weaknesses) and external factors (opportunities and threats) an organization faces. We recommend using ConceptDraw MINDMAP for determination and structuring factors employed in SWOT analysis, and then, ConceptDraw DIAGRAM for the SWOT Matrix creation. 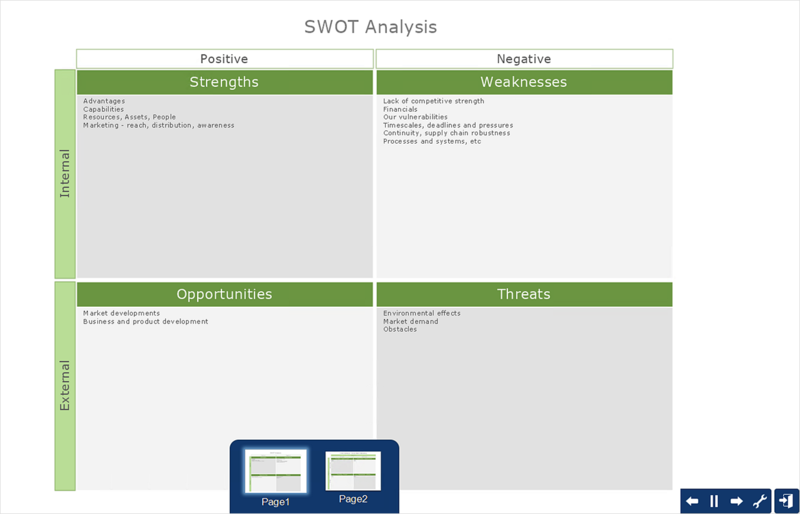 The ability to create a SWOT Matrix from a mind map is delivered by the SWOT and TOWS Matrix Diagrams solution. Install this solution via ConceptDraw STORE. Find it in the Management area of the Solutions. The solution will be installed for both MINDMAP and DIAGRAM. Activate Input and Output options using the Preferences (macOS), or Options (Windows) dialog. From ConceptDraw MINDMAP inputs choose the Business Productivity category and run the SWOT Analysis template. Create a mind map by filling a template. From ConceptDraw MINDMAP Outputs, choose the Business Productivity category and run the SWOT Analysis output. Result: A SWOT Analysis matrix will be created from Mind Map structure through ConceptDraw DIAGRAM. It is displayed as a Presentaation.